Selena Roberts brought me yeast rolls once upon a time. At least there’s a very good chance she did. Quincy’s was probably my favorite restaurant as a kid, and a trip to Auburn to visit my grandparents in the late 80s meant a trip to the Quincy’s on Opelika Road (RIP), which is where Selena told me she worked her way through Auburn as a waitress. Why Auburn? 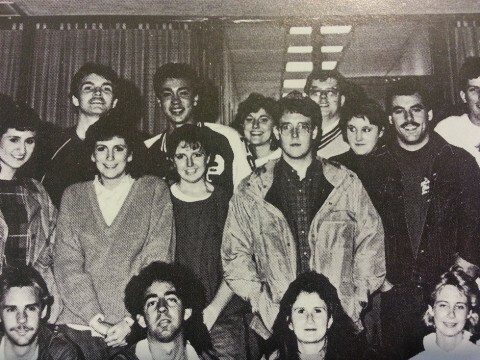 She had family at Auburn, her older cousins, and because she “fell in love with the campus.”So Selena Roberts was in love with Auburn University once upon a time. So… what if it’s not some private vendetta? What if it’s as simple as sometimes just wanting to write what you know? Or what you think you know? What you were absolutely “you betcha” certain of that hour you first believed in the justice-wielding, program-crippling, attention-earning power of journalism? She sees where I’m going. Maybe it doesn’t. 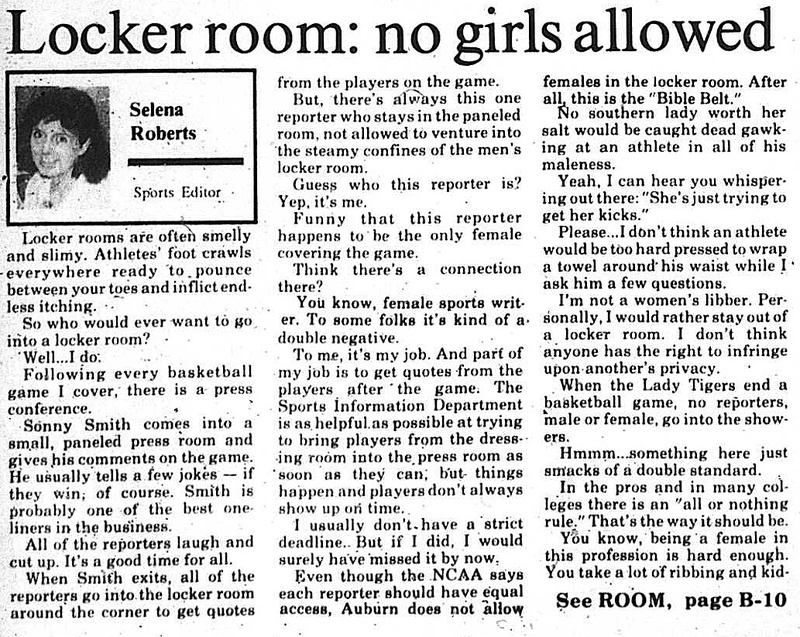 But if you wanted to try to psychoanalyze her career along those lines, to try to explain why Dirty Auburn seems to be, as her editor at the Plainsman put it, “a favorite subject for her,” here’s plenty of microfiched material to work with. 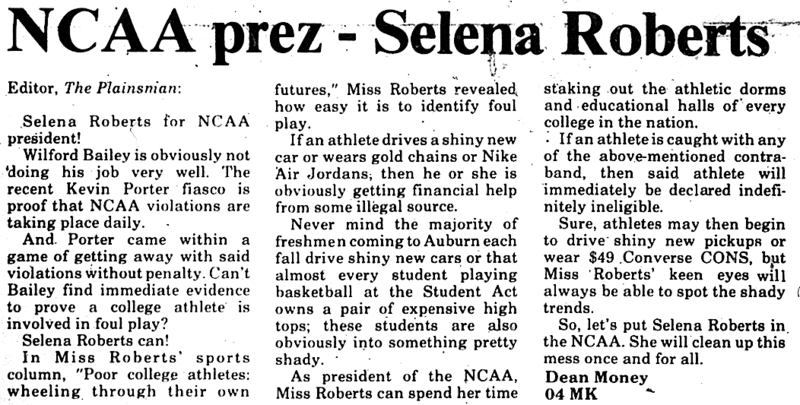 Here’s Selena Roberts in her own words, then and now, about her alma mater. Plus some other random stuff. 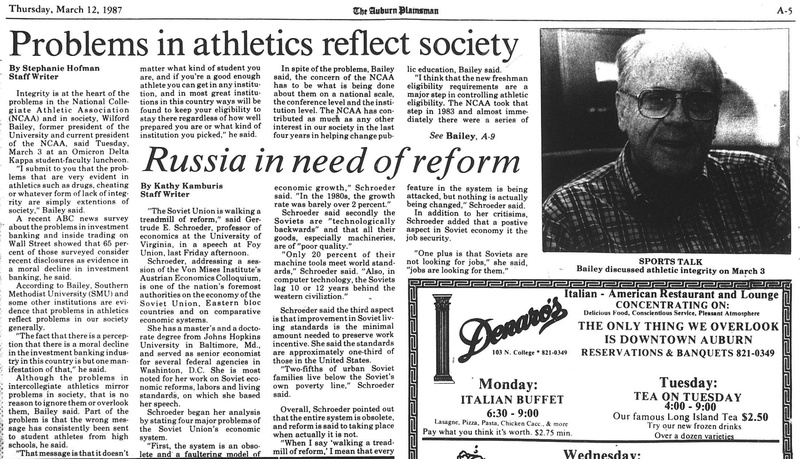 “If the mothers and fathers of some of the athletes are feeling such a financial pinch, then how come their children are seen driving some of the shiny new cars lining the parking lot of Sewell Hall? 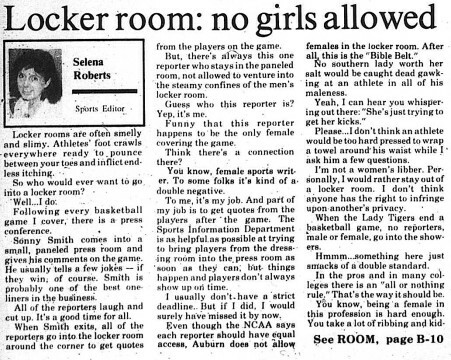 And it’s a shame the poor pitiful athlete has to wander the halls of Haley Center wearing gold chains and sporting new clothes, right down to a $70 pair of Nike Air Jordans. Evidence of foul play? You betcha… There’s shadier stuff here than that found beneath the Oak trees in front of Samford Hall. 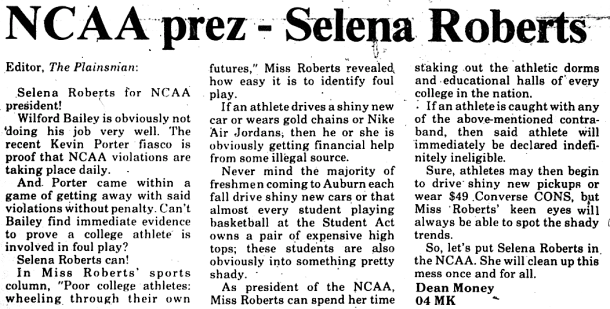 Of course it’s hard to prove how many athletes on this campus fall into the traps of money. For some reason, car dealers have a distaste for disclosing to who and for much they sell cars. 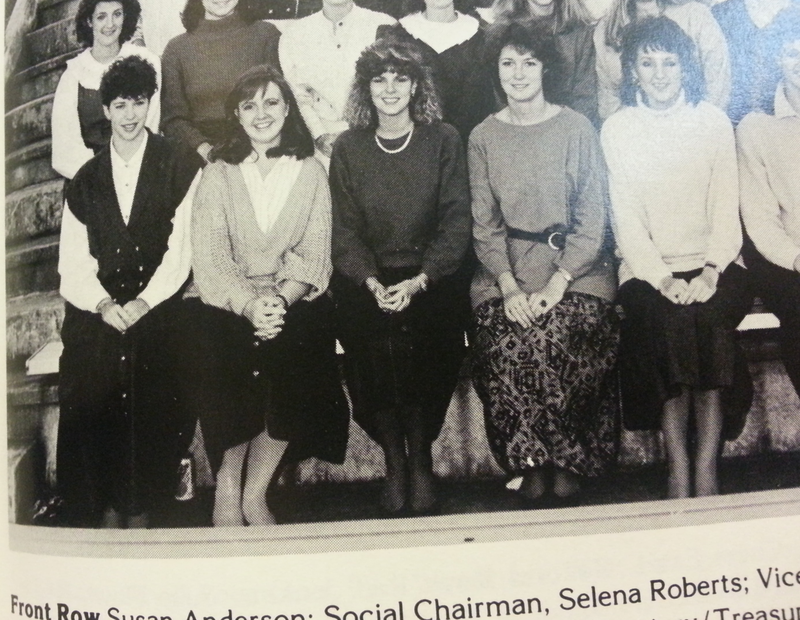 Selena Roberts (front row, second from left), Vice President (1986-87) of Tiger Trackers, the official hostesses of the Auburn men’s tennis team. 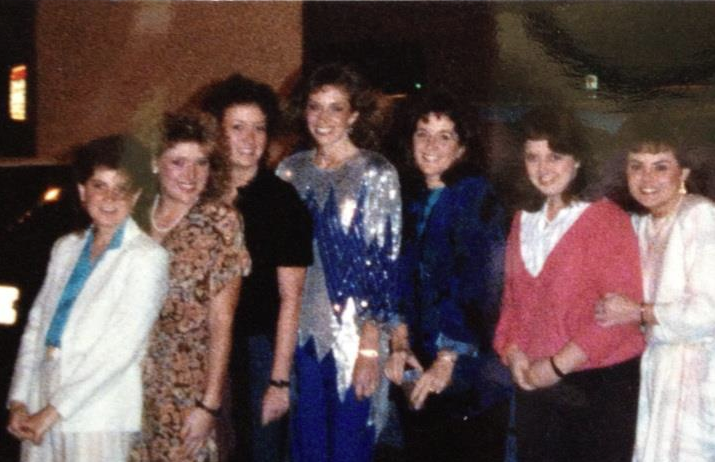 Kimberly Key Matthews (second from left) and Selena Roberts (second from right) in Las Vegas with the Tiger Trackers, 1986. She finished the season tied for last with Bret Pippen. 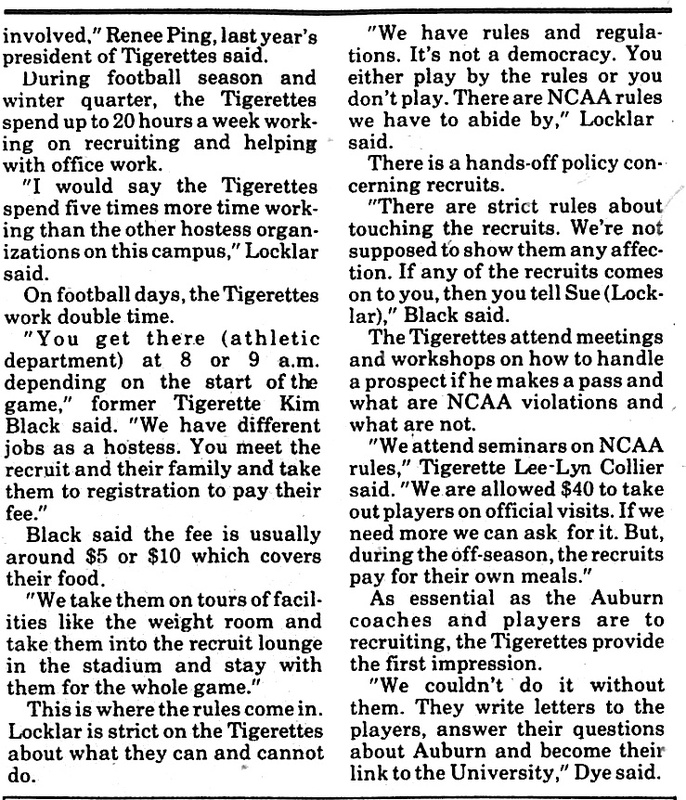 “I will always remember the first time I asked Pat Dye a question. It was after a press conference. As I spoke, my voice squeaked like a scared little girl weakened by the God of Football. Good gosh, I thought I was going to throw up. Well, I don’t fear him anymore. He’s human. But, he does have an unmistakeable aura. In person, Dye has an intimidating, cutting stare. It’s his defense against, sometimes hungry, reporters. But I’m sure there is another side to the coach which escapes my presence. 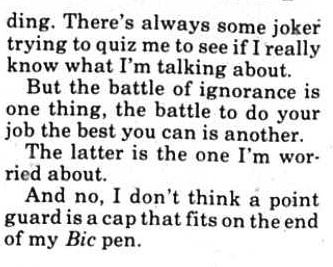 I could have told you exactly what kind of man Dye was before I had to write about him. Now, now… I don’t know him at all. Since I can remember, I had always longed to interview Dye about himself, not about coaching, but about who he is away from the sidelines. 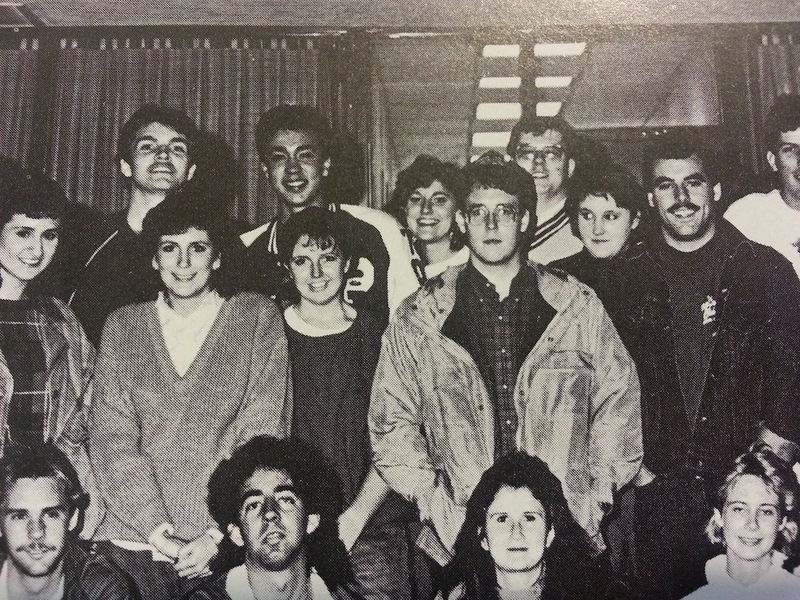 Selena Roberts (middle row, third from left) standing next to Plainsman editor Bret Pippen (middle row, fourth from left) in the Plainsman staff photo for the 1987 Glomerata. I wonder if Selena has ever written anything Positive. Meh. I’ve seen better writing than Selena’s under the comments section. I think a lot of her story ends up being simple ignorance of the steps the school took on the spice issue. Soon-to-be convicted felons and their parents aren’t really going to give a fair picture of whether the school acted responsibly. 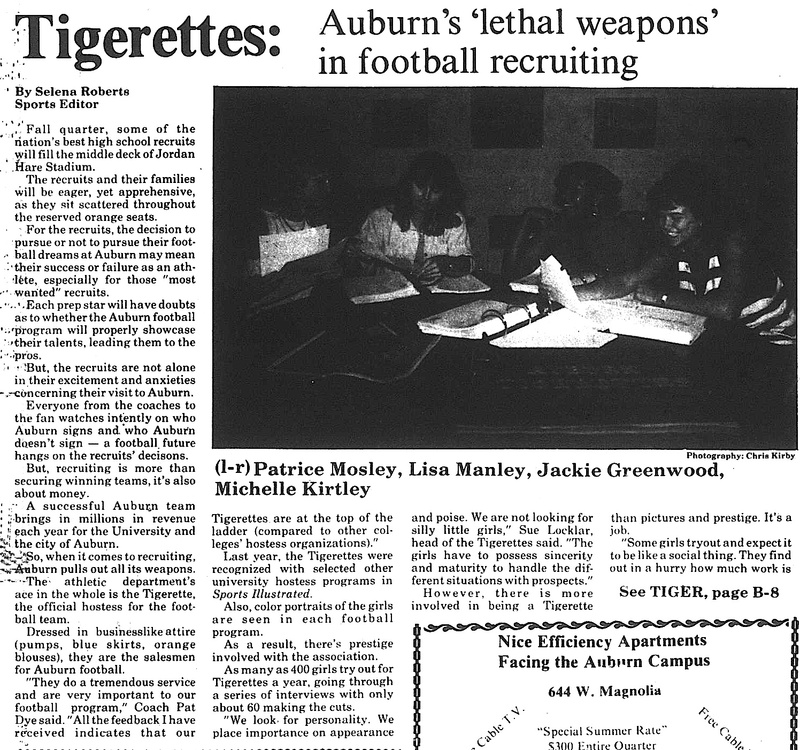 And since her contact letter omitted any references to drugs, racism, or extra benefits, she practically made sure Auburn wasn’t going to give her its side of the story. I have to think she’d do things differently if she could – but of course that might have resulted in a less scandalous story, so maybe not. It is a sad situation. Her career is not turning out the way she thought it would. Fired (I believe) from both Sports Illustrated and NY Times. 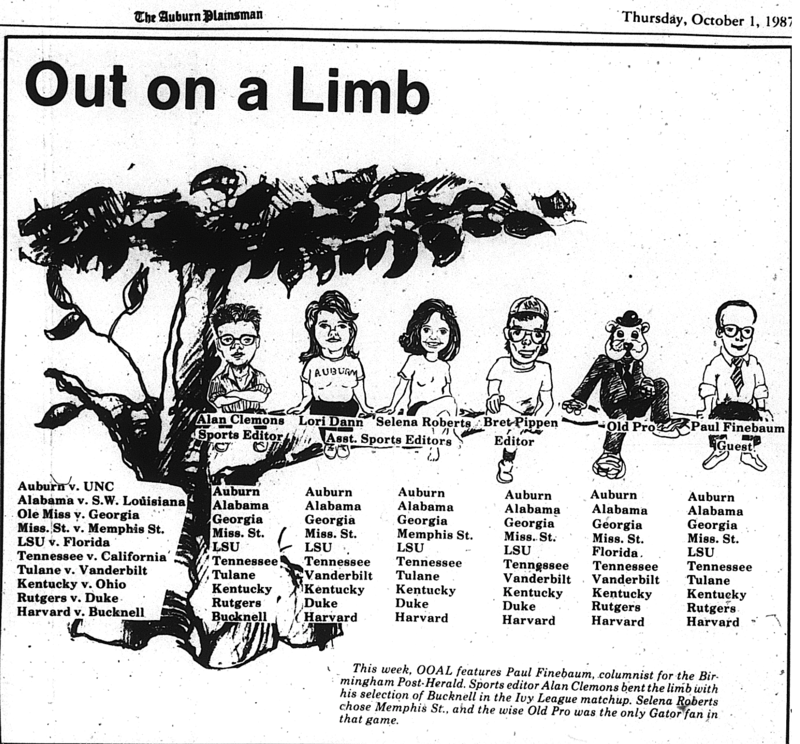 Career embarrassment with the Duke Lacrosse story. She was desperate and so sometimes you kill what you love. 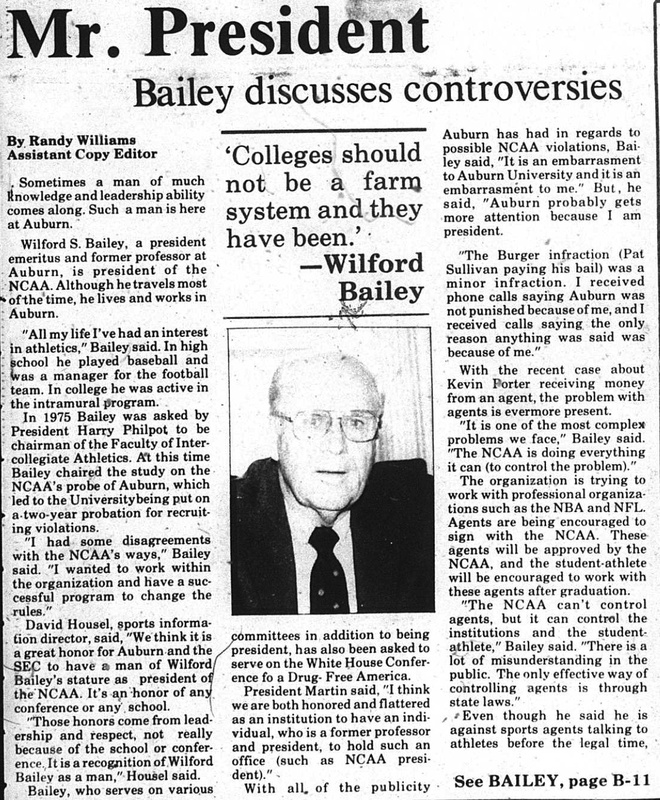 I don’t know that she loved AU, but it was convenient and piling on is alway easier than the first guy making the hit. I’m glad her mama left her money. Sooner or later her BS was coming to an end.